It's been a while. A long while. 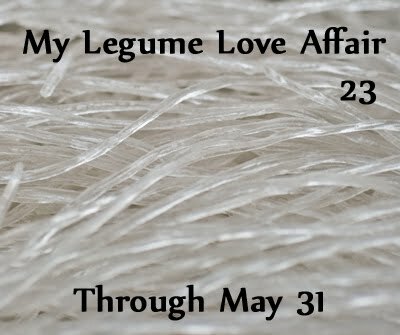 I am very happy to report that the May edition of My Legume Love Affair is being hosted here by yours truly. This month is not only special because I'm running my own show for a change, but that I've scored for prizes, not one, but two copies** of Mallika Basu's newly published stylin' and sassy cookbook, Miss Masala - Real Indian Cooking for Busy Living. Many of you will already know Mallika from her popular food blog, Quick Indian Cooking. Since I've two copies to give away, I will be running two separate drawings: one for U.S. residents that also will include the monthly Hurst Bean prize, and one for international participants. Each book will be shipped directly from me at my expense. * Post a recipe featuring legumes between now and May 31, linking it to this announcement. * Multiple recipes are permitted (although only one submission will be counted towards the random drawings). * Recipes from those who are not bloggers are welcome and make eligible the participants to win either prize. Please email me your name, location, recipe, and optional photo, and I will ensure you are included in the drawing and round-up. * Location of each participant is necessary so that I will know who qualifies to win the supplemental Hurst Bean prize, shipped to U.S. residents only. If you don't want your location published in the round-up, please indicate this in your email so that I can maintain your privacy. * I will post the round-up/winners' announcement during first week of June. 1) One copy of Mallika's new book, randomly drawn for a U.S. resident. 2) One copy of Mallika's new book, randomly drawn for an international resident. 3) Hurst Bean Prize - A six-pack assortment of the U.S. winner's choices shipping directly from the Hurst facility. This generous prize is provided by Hurst Bean and has been arranged through their initiative. I do not receive product nor financial compensation from Hurst Bean. ** The books which I am offering this month are complimentary copies sent to me by Harper Collins, the publisher. I have also been provided with a copy for my own personal enjoyment. I am very much looking forward to being dead center in MLLA's activities this month, so hit me with your best recipes. I'll be ready for them! Thanks always for making every month special with your delicious dishes. I'm looking forward to seing the roudup! I did hear about the book in other blogs. Sure will try to send you something. couint me in.. happy hosting..
Will send in my entries. And wow, I'd love one of those books! I missed out last month, I think. Have to be more vigilant this month. Good to see you back! I can't wait to see this round up!!! Must the dish be vegetarian? Very nice theme..Sure will try to send some entries. Great contest! Can't wait to see what everyone sends in. I have my thinking cap on, now. Hopefully, I will come up with something good. Great choice. I hope u'll like my recipe. Thanks, everyone! I appreciate every comment. : ) I'm trying to keep up with all your great recipes as I write this. Keep 'em coming! Anh, I do not restrict recipes when I host MLLA. I leave that to the individual guest hosts to decide. Sra - Hope you can make it, but I always understand when folks are pressed for time w/ other things. A good event and would like to participate, I have posted 2 recipes and emailed it to you, thank you pls let me know if you need any details. I just sent my very first submission! Manged to take part this time. Just sent you my entry, Susan. I was going to participate this time round. I really was! But here it is 2 June. So sorry to have missed the deadline yet again.